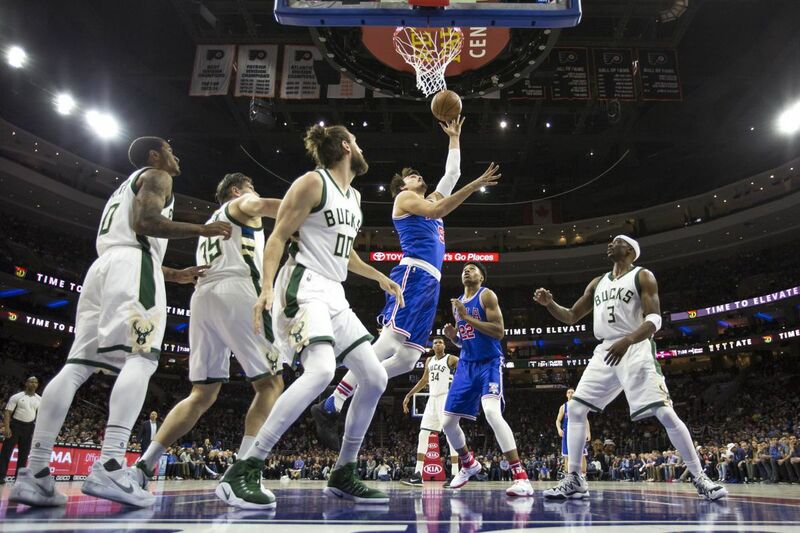 Neither Dario Saric (9) nor teammate Joel Embiid won the NBA’s Rookie of the Year Award. But as finalists, they showed the 76ers’ “process” might be working. And so, after the superficial showmanship and glamour of the NBA awards show on Monday, after another sign that the league's athletes and executives and television partners see themselves as actors and rappers on a stage as much as they do competitors in the arena, the 76ers ought to have no illusions about their standing in the sport now. They're the outcasts and outsiders, the ones who dared to destroy the fragile web of consensus that holds together the league's entire entertainment complex, and it was difficult not to see Dario Saric's or Joel Embiid's failure to win the rookie of the year award as a small casualty of the Sixers' impertinence over the past four years. For all the sportswriters and broadcasters who believed either Saric or Embiid was most deserving of the award, splitting the vote between the two and allowing the Milwaukee Bucks' Malcolm Brogdon to win, there were likely as many or more who were never going to reward the Sixers for their "process." Understand: There are loads of people who work within or cover the NBA who are thrilled that Saric and Embiid, two tangible and substantial products of the Sixers' tanking, went unacknowledged and uncelebrated Monday night at Pier 36. Hours before Monday's award show, in a question during an interview of NBA commissioner Adam Silver, NBC's Dan Patrick captured the contempt that still lingers around the league for what the Sixers have done. "I love that the Sixers say, 'Trust the process,' " Patrick said. "Boy, that really dresses it up when all you're trying to do is lose games." This was always the most laughable talking point against Sam Hinkie's strategy for rebuilding the Sixers — that all he ever planned to do was lose games into perpetuity, that there was no point to the Process beyond abject and deliberate ineptitude. No, what Hinkie and the Sixers exposed was the contradiction at the core of the NBA's image: The measures a team sometimes must take to lift or keep itself among the league's elite don't necessarily jibe with offering splashy, ultimately empty entertainment in the here and now. The NBA wants to make every game a show, a big-ticket Broadway-style experience. Its rights-holders play up its superstars and their personalities, their social-media reach and the import of every exchange of passive-aggressive insults between ex-teammates, and the league can't afford to have understudies and amateurs performing too often. It wants stars, but it doesn't want teams to tank to get stars, even though the best way to get stars is to tank. This was the unspoken agreement that the Sixers defied, and for following the incentives that the league itself had established, for not overpaying for second-tier veterans who could never deliver a championship, for the heretical refusal to keep up appearances and gin up false hopes, Hinkie became a pariah. He might be the biggest in the league's boardrooms and offices now, but he wasn't the first. Remember, it wasn't long ago that former commissioner David Stern lashed out at Gregg Popovich and the San Antonio Spurs for sitting Tim Duncan, Tony Parker, and Manu Ginobili — for prizing the long-term benefits of resting superstars in the belief that it would help the Spurs be fresher for the games that mattered most. That fight ironically turned Popovich, the coach of the NBA's crown-jewel franchise, into a hero of the league's counterculture. Don't think for a second that Sixers coach Brett Brown, a Popovich disciple, doesn't appreciate that he himself is in a similar position now, and don't underestimate what a powerful motivational tool that anti-establishment pose might yet be. The league doesn't like how we got here, fellas, but we're here anyway. Joel and Dario got screwed. Ben and Markelle probably will, too. Doesn't matter. We do what we do how we do it. Let's go. It's a pretty stark contrast with the team that promises to become the Sixers' newest rival. The Bucks, according to the still-prevalent conventional thinking, went about things the right way. They had a terrific young player, Giannis Antetokounmpo, fall to them with the No. 15 pick of the 2013 draft, and they took Jabari Parker with the No. 2 pick in 2014, and they plucked Brogdon from Virginia in the 2016 second round, and no one has accused them of being anything other than fortunate one year, godawful the next, and fortunate again. "Guys in Philly want to talk about the process," Bucks owner Wes Edens told reporters earlier this month. "I'd rather talk about the results." Hey, if you were a billionaire who had threatened to relocate your NBA franchise unless your state's taxpayers covered half the cost of a new arena — and Edens is such a billionaire — you'd be an insufferable chest-puffer, too. But just as the Sixers have often drifted into premature revelry, unveiling a marketing campaign around Michael Carter-Williams two weeks before trading him, holding a pep rally over getting the No. 1 overall pick in 2016 after finishing with a 10-72 record, Edens' haughtiness belies the Bucks' actual achievements, or lack thereof. Milwaukee just went 42-40, its second winning season in the last 14 years, and Edens might be getting ahead of himself if he's assuming that the Bucks' relative success gives them a head start on the Sixers in the race to a championship. When NBA owners reportedly pressured the Sixers to stop tanking, when the combination of an 0-18 start and Jahlil Okafor's Boston street fight finally proved the tipping point for Hinkie's tenure here, the installation of Jerry Colangelo as overseer promised to bring the Sixers to heel. But in truth, the league was too late to stop Hinkie. He had accumulated all those precious assets, and Bryan Colangelo, to his credit, has generally deployed them smartly, and what do you know: There was Adam Silver telling Dan Patrick on Monday, "I know there's a problem now" with the lottery, all but admitting that the Process' cold, audacious logic had forced him to consider sweeping change. Embiid, Saric, Ben Simmons, Markelle Fultz, still more picks, plenty of salary-cap space: If things go right for the Sixers, soon enough no one will care about who got snubbed Monday. Malcolm Brogdon was the safe choice for just another award on just another prime-time program. It's the ones willing to shake up the system who really scare everyone to death.